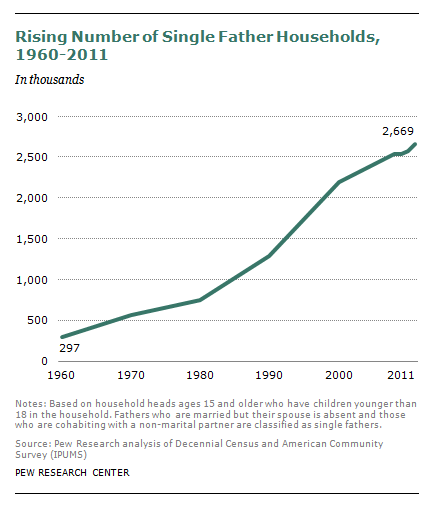 The Pew Research Center just released a report that describes the rapid increase in the number and proportion of single-parent homes headed by fathers. Since 1960, the number has increased from less than 300,000 to more than 2.6 million (as of 2011), more than a 900 percent increase. While that number is still far short of the number of single-mother homes (8.6 million), nearly 1 in 4 single-parent homes (24 percent) are now headed by a dad. I was asked to appear on a radio talk show this week along with the lead researcher of the study. Several single dads called in to share their stories about what it’s like to raise children as a single dad. One father’s story in particular struck me. He is only 22 and has three children—the oldest is 7. If you do the math, he had his first child at 15. And yet he finished high school and became an electrician despite the mother walking out on the family. He accepted the responsibility of caring for his three children, and he and his children are apparently doing very well. When the host of the show asked him what he most needs, he said a female presence for his two daughters. This was a theme echoed by other callers. That need isn’t surprising because, as I shared with the listeners, single parents most need resources that meet their children’s needs. Perhaps counter intuitively, when single parents focus on what their children need, they meet most of their own needs. This theme also made me think about what single dads need that are unique to them or that aren’t as readily available to single dads as they are to single moms. Accessing these resources will ultimately help single dads help their children. Female mentors for their daughters and sons. Single dads desperately need female mentors for their daughters and sons. Their daughters need the role models that only women can provide. Their sons need the relational models that only women can provide. Single dads should look within their immediate circles of influence—sisters, cousins, neighbors, co-workers, etc.—for women willing to spend even as little as an hour a week or a few hours a month providing guidance from a female perspective. Community support groups for single dads. America’s communities are full of support groups for mothers and single mothers that provide support for the challenges faced by single moms. Our communities are bereft of such groups for dads. In fact, I’ve heard countless stories of single and stay-at-home dads who have joined mothers’ support groups because they couldn’t find groups for dads. To be fair, single motherhood has been much more common than single fatherhood for a long time, so the availability of groups for single moms is partly a function of time. But it is also a function of living in a culture that looks more positively on single motherhood than single fatherhood. We men can also be our own worst enemy because, in this case, we tend not to group as much as women do for mutual support, especially when it comes to parenting and other emotionally-charged issues. Access to and a willingness to use government and social-service programs that help low-income single parents. As the Pew report notes, single dads are more likely than married dads to live in poverty—1 in 4 single dads lives at or below the poverty line compared to less than 1 in 10 married dads. So there’s a need for these dads to find the same kinds of assistance available to low-income single moms. These dads must also be willing to ask for this help when they need it, which is a tough pill for dads in particular to swallow because of the importance fathers place on providing financially for their children. Fathers often view acceptance of help as a sign that they have failed as a man and father. Viewing this assistance as temporary help that gets single fathers and their families through tough times can help them overcome that perspective. Online resources. There isn’t nearly as much available on the Web for fathers, let alone single fathers, compared to what’s available for mothers and single mothers. Fortunately, there are a few resources such as Single Dad and the Single Dad Network, part of the Single Parents Network. And because single fathers need the same resources as married fathers, they can avail themselves of NFI’s resources for fathers. These resources include the very popular Countdown to Growing Up™ child growth and development tracker. Single dads should sign up for NFI’s twice-weekly, free Dad Email that contains tips and guidance for dads and join the Dads Club.